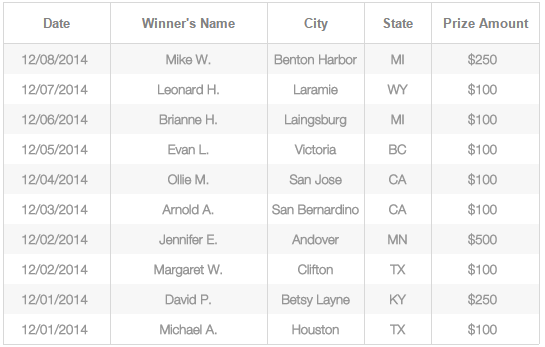 A big congratulations to Mike W. of Benton Harbor, Michigan who was our latest $250 Winloot Weekly Winner. Did you know that you are automatically entered into the weekly prize drawing each time you play a game on Winloot and that you get another entry for each number that you correctly match in every game you play? That means that the more games you play on Winloot the more entries you receive! However, even one entry gives you a chance so be sure to play Winloot and get your entries! Here is a list of other recent winners. Would you like to see your name here? On top of the $250 Weekly Prize, Winloot of course offers our very popular $100 guaranteed daily cash prize to at least one player every day. You also get an entry to win an iPad Mini with each game you play. Other members have won bonus prizes such as cash and gift cards from our special email promotions and we gave away some gift cards and cash last week for users who commented on special blog posts. Be sure to keep an eye on the Winloot Facebook page for special giveaway opportunities that you won’t find out about anywhere else. These are often very low odds promotions giving you a great chance to win a prize and get your name on our big list. Thanks for being a loyal Winloot player and congratulations to all of our winners! Meet Rosario Matos, Newest $5,000 Winloot Winner! Winloot Email Leads To Bonus Payday!